← Who Shoulders the Blame? …………March 25, 2013. 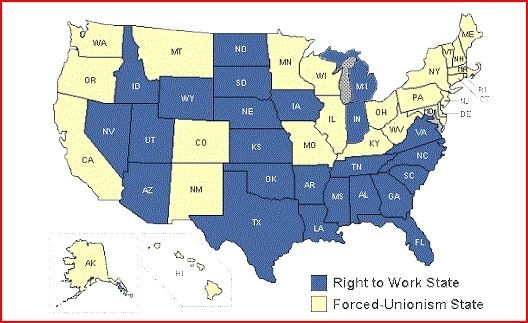 What do “Right to Work” laws do? Right to work laws allow individuals to work within a unionized company without paying union dues. Unions refer to these individuals as “free-riders”. The union is still required by law to represent these employees. By lowering the amount the union takes in for its various functions the right to work laws weaken the union’s ability to act and to bargain. This has the effect of lowering wages in those states with right to work laws. Such laws are supported whole-heartedly by business corporations that desire the demise of the union and its higher wage rates. Individuals who support these laws have been fooled into thinking that such laws benefit them. To understand why such laws are not beneficial to the employee we have to examine the differences between unionized and non-unionized workplaces. If unions did not exist is there anyone who thinks wages would be as high as they are? Sure, more people might be working, but these workers would be earning only a fraction of what they deserve. Every worker would be subject to the favoritism of the owners and managers. Yes, those that benefit from such favoritism would object to unions. Any worker could be dismissed for the the most minor of reasons, or no reason at all. Does anyone doubt that at some companies the workers would be treated as slaves? Sweat shops would abound. Everyone would be at the mercy of the whims of the rich and ‘entitled’. Money would probably be worth more. However, that would be because there would be so little of it to be had. The rich would be richer, the poor, poorer. Whenever the business owner gave a few crumbs to his downtrodden workers it would be hailed as a benevolent act of kindness, though in reality it is given with the thought in mind that it might deter an outright rebellion. Keep them happy, would be the motivation, or at least not angry. When a non-unionized business is unionized the relationship between employee and employer does change. The owner is then obligated to deal with a group rather than the individual concerning wages and benefits. Adverse financial effects could occur if an agreement to working conditions is not met. What the membership wants is a fair wage for work done. It is not in the interest of the union to make things so difficult that the business cannot continue (Not that this does not happen at times). Favoritism goes by the wayside, at least where management is not concerned. Seniority becomes an important quality should layoffs be necessary. In the presence of unions, even a non-unionized business must provide an adequate incentive for the retaining of quality employees. Wages everywhere are higher in the presence of unionized businesses. Companies are only going to payout what they have to. Having worked in both unionized and non-unionized settings I prefer unionized. This is despite the fact that the union leaders themselves, at times, play favorites. Gung-ho union supporters are given extra attention to their grievances as compared to those who merely are members for the sake of enabling them to work. In union atmospheres you must be careful to remain in the good graces of the union leadership. The only detrimental effect of a union, as I see it, is that, in most cases, the worker who excels is given no more consideration. There usually is no extra reward for exceptional work. This can lead to employees doing only what is necessary to get by and to an attitude of not caring about the future of the company. Of course, I have seen lots of that even in non-unionized businesses, but the individual is usually soon gone, unless they are one of the “beautiful people”. Unions, as I see it, exist only because of the tendency of human greed. No, not that the unions are greedy, but because the wealthy are extremely reluctant to share the wealth. If all business owners had always been generous, providing good working conditions at fair wages, what need would there be for the existence of unions? The very thing, unions, which the wealthy abhor, are the result of what the wealthy have done. Unions are a necessary entity. If ‘Right to Work’ laws endanger them then ‘Right to Work’ laws should be fought wherever they exist. Those individuals that support ‘Right to Work’ laws are either rich, or have been duped. This entry was posted in Organizations, Political comment and tagged Right to Work, Union busting, Unions. Bookmark the permalink.